The RX100 is loaded with shot-enhancing features and high-quality components. The Exmor CMOS image sensor and refined BIONZ image processor work together to facilitate fast DSLR-like focusing speeds even in low-light - and without sacrificing any detail. The lens supports 3.6x optical zoom and 7.2x clear image digital zoom. It also features a multi-layered T coating that dramatically reduces ghost and flare caused by light reflection. For added convenience, the RX100 is equipped with a 3" Xtra Fine LCD display so you'll be able to quickly scroll through menus and pictures. The display even features WhiteMagic technology for increased visibility under intense sunlight. Other features include a customizable function button that supports up to seven different functions and a memory recall (MR) that can memorize up to three groups of preferred settings. The camera also features Optical SteadyShot with Active Mode, which eliminates blurry images when you're walking with the camera. Sony's even bolstered the image stabilization with an electronic image stabilization that affords blur-free movie shooting and steady zooming in unsteady situations. You can use the Auto Portrait Framing function to capture an additional, beautifully framed and balanced full resolution portrait, when you're out shooting stills. The camera also supports four focus modes, auto HDR, multi-aspect ratio recording, a digital level gauge, multi-frame noise reduction and much more. 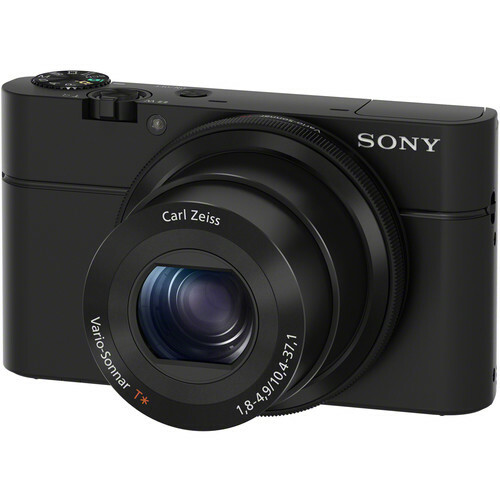 Sony designed the DSC-RX100 for capable photographers looking for a high-end compact camera to take on the go. Anyone who spends a lot of time shooting family and friends will also appreciate the camera's Face Detection and Face Registration technology. The RX100 can detect and register up to eight faces. Plus, it will automatically adjust focus, exposure, white balance and flash to ensure you get a clear and crisp shot of those closest to you. You can even tell the camera to prioritize children or adults. With a laundry-list of features and excellent components, the RX100 offers amazing quality and creative freedom in a stylish, compact package. Box Dimensions (LxWxH) 6.1 x 5.7 x 3.9"
Cyber-shot DSC-RX100 Digital Camera (Black) is rated 4.6 out of 5 by 363. Rated 3 out of 5 by Elena GH from compared to my panasonic lumix although I do like my new camera, it is not as great an improvement aa I had hoped for. I like the color better on my panasonic lumix... I like the resolution better on my new Sony... when I get the light / exposure just right the sony is fabulous. but it is harder to get the beauty of the colors to show on the sony.. more often the lumix photos look 'prettier' but perhaps not as exact. I have been using my sony since I got it ( 8 months ago) and now it won't turn on at all.. not sure what the problem is ( whether faulty battery or some other problem ) and have to send it back.. annoying... to wrap it up. not sure I would recommend it to a friend. Rated 5 out of 5 by Bob56 from Excellent Camera I wanted a small camera with a large sensor. I did some research and decided to buy the Sony RX100 and i am glad i did. There are four versions of this camera from model 1 to model 4. I chose the original model 1 because it had the features i needed. The more expensive model 3 and 4 have 4K video, EVF, Adjustable LCD screen. These are great features but i don't need them. The RX100 has an easy menu system. It is made of aluminum and not cheap plastic. Photo and video quality is excellent. Battery life is good. Camera has a 3X optical zoom, I wish it had a 10X zoom. This is a great travel camera. I recommend an LCD screen protector because the screen can be easily scratched. Rated 1 out of 5 by Richard in Albuquerque from Warning - Extreme Humidity Sensitivity I got it 6 months ago. We just returned from a 1-week Disney Cruise with the g-kids and the LED screen stopped working. I sent it in for warranty repair...and got it back today un-repaired due to signs of corrosion. It was not subject to anything but 1 week of humidity on a cruise ship (which didn't bother our iPhones or iPads). Now, apparently the camera is toast...a very expensive and disappointing experience! I recall seeing another review mentioning the SAME issue, before purchasing it. I didn't heed the warning because we live in the desert (NM). Sadly...I won't take another chance on a Sony product. Rated 5 out of 5 by Shane from So far, so great I bought this camera to cary in my purse as my DSLR does not fit! And sometimes, I want to snap a photo and have only my iPhone (which is not bad, but limiting). I love the high ISO without much distortion and shooting in dark places has been a great advantage. Also, the focus is very fast and action shots are much better than my G10. The saturation is also good, but so is my Canon G10. I am still adjusting to the camera's logic and menues, but it is intuitive. I am also adjusting to the absence of a viewfinder and the size of the camera in my hand. I have no complaints. The flash IS poor, but with the high ISO settings, I don't need it! Rated 5 out of 5 by RoyBoy from Great Little Camera I am a professional photographer that has All the best Canon DSLR bodies and L lenses. I wanted a small carry around camera and bought the Sony Rx100. WOW... this little camera is great,with a very sharp lens. You can shoot fast when you need to or do HDR images.I shoot mostly RAW images and the Sony software is not great, but if you have Lightroom or Aperature it is easy to edit your shots. The only down side is there is a learning curve with all the settings, and the manual is not good. I bought a book for my Ipad that explains all the functions and more. This is a great little camera!!! Rated 5 out of 5 by Robert C. from Sony P&S RX100 The quality of the shots are more then acceptable. This is a superior point & shoot camera. The large sensor makes for very crisp and clear photos. If I could rate it 6 stars I would. Photos right out of the camera are excellent and with very little post processing they are beautiful. If you don't like this camera then you must be doing something wrong and can't operate it correctly. The battery life could be a little better so I recommend buying a spare battery. The automatic settings are perfect for a beginner so don't worry if you are new to photography. I would highly recommend this camera to anyone, beginner to pro. What is the FCC ID number for the RX100 ? Declaration of ConformityTrade Name: SONYModel No. : DSC-RX100Responsible Party: Sony Electronics Inc.Address: 16530 Via Esprillo,San Diego, CA 92127 U.S.A.Telephone No. : 858-942-2230This device complies with Part15 of the FCC Rules. Operation is subject to thefollowing two conditions: (1) This device may not cause harmful interference, and (2)this device must accept any interference received, including interference that may causeundesired operation. Can the on camera flash trigger remote Sony flashes in TTL mode??? The Sony Cybershot DSC-RX100 Digital Camera does not have a wireless flash feature. The built-in flash is not designed for wireless flash triggering usage with off-camera flashes. what language is available for menus on this machine? Can the Sony RAW files be opened in Photoshop without a Sony RAW converter? Yes, but you will need either Photoshop Elements 11, or CS6, with the current Adobe RAW update installed. Does this camera support UHS-II card speed using the additional row of pins? Does the RX100 have a US warranty? This camera is covered by Sony's USA one year limited warranty. can i transfer avchd movie to win 10 computer? how? The format of AVCHD is designed to work with editing programs. You could use programs like Premiere Elements or Cyberlink PowerDirector to see the files and to edit them, B&amp;H Numbers ADPE15AMVT and CYPOWERD8U.